From the turtle nests and jade waters of Eagle Beach to the crystal flats and deserted shores of Savaneta, Aruba has a stretch of sand for every mood. Catch sight of stone and ceramic treasures at the National Archaeological Museum and find out about the colonial past at the Historical Museum of Aruba. The bright blue seas of Aruba are littered with famous shipwrecks and psychedelic coral gardens. Rugged national parks, donkey sanctuaries, rainbow feathered bids and butterfly farms – Aruba delivers more than her fair share of paradise. The capital of Aruba may have the cruise ship crowds, but it manages to hold on to its low-key feel. The pretty painted buildings that line the port have become the poster child for the allure of the ABC islands. A well-orchestrated blend of local charm mingles with top tourist facilities. Five-star hotels and world class restaurants sit side-by-side pop up shops and fish shacks. 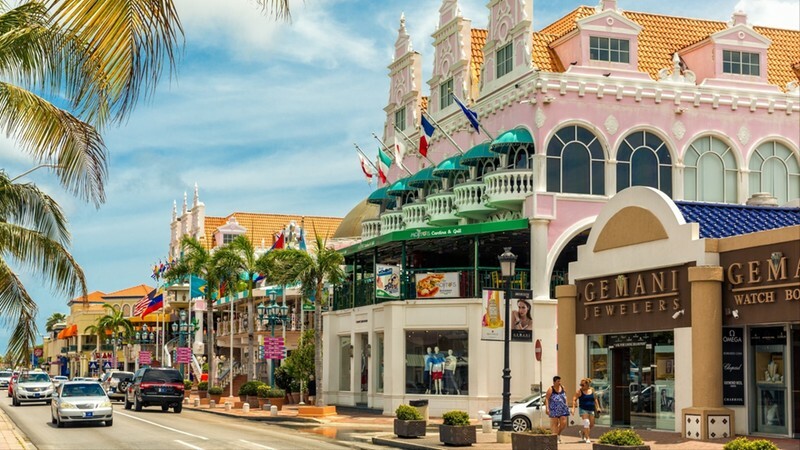 Days are best spent wading in crystal waters of the famed Palm Beach, cycling in Linear Park, and splurging on tax free designer goodies at the Renaissance Mall. After sterling suppers on your yacht, you can roll the dice at one of the casinos in town. Away from the hive of lavish resorts and brightly painted Oranjstad, yacht charters in Aruba can set sail for the islands wilder spots. The Arikok National Park is a place of limestone caves, secret beaches, nesting spots for leatherback turtles, and natural pools for cooling afternoon dips. A visit to the rugged Boca Prins is a chance to see a different side of Aruba, one far from the pastel colours of Palm Beach. Here, you will find wild hikes, 4X4 adventures, and bodyboarding competitions in the churning surf. 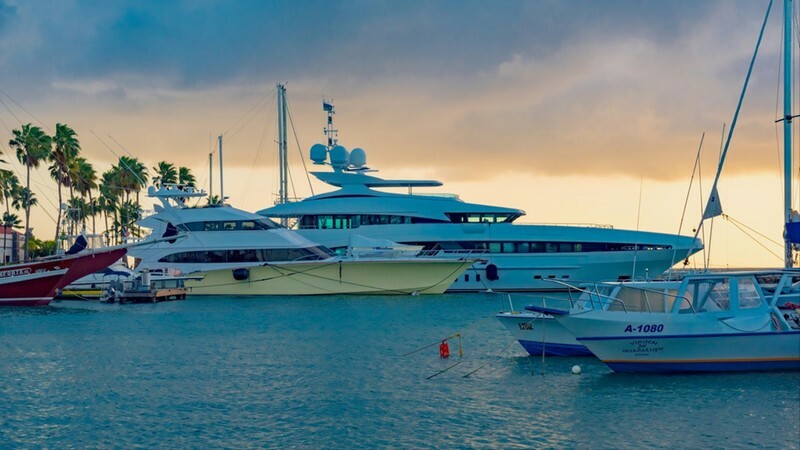 The greatest gift for a yacht charter in Aruba is to stumble across a strip of sand sent from heaven and this is what you get with the gorgeous Palm Beach. Often declared as one of the best beaches in the world you can expect two miles of pearly sands, thatched shade, and a tapestry of blue. This darling Dutch island can be found just outside the hurricane belt: ensuring tranquil seas and sweet sea breezes, making for exceptional water sports and enviable sailing conditions. Winds rarely pick up past the 20-knot mark, a comforting number for those who don’t want their sojourn ruined by a tropical storm. 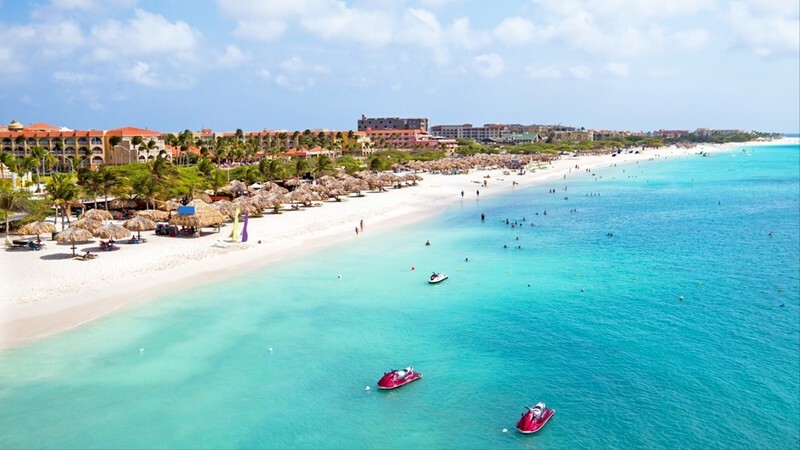 At her most popular during November – April, Aruba is prime real estate for those looking to flee western winters. Those seeking a colourful Caribbean charter that knows how to balance excitement with the big chill will fall head over heels for Aruba.